Aironotics is the go-to drone operator for all your creative, dynamic and cinematic drone aerial filming an photography requirements in the Netherlands. Combined with over 1000 clocked flying hours we specialize in precision, reliable and close proximity flying. 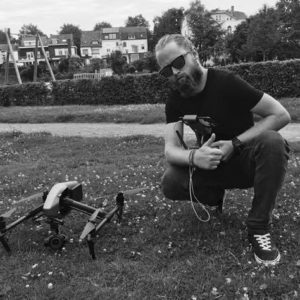 Aironotics was founded in 2016 by Robbert Kuijper, after graduating with a thesis on Drone Journalism, Robbert has been active in a variety of fields including Drone Photography, Cinematography, VR, Photogrammetry and is currently part time active as a Course developer and Flight Instructor for the DJI UTC Training course at Drone Flight Academy.